I fell in love with the fabric for this slipcover. 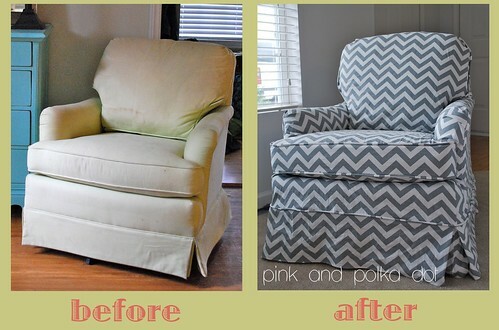 Allison, who is due in August with her first born, contacted me about making a slipcover for this chair that will go in her little one’s nursery. She gave me a sneak peak of the nursery when I delivered her chair. Yall! They painted the room in yellow and gray horizontal stripes. I soooo wished I had taken a picture. Maybe when she gets it all put together she’ll email a pic to me. It’s gonna be so cute! Makes me want to paint stripes on my walls right now! Oh my goodness…. I love that fabric!!! That turned out so good. GREAT JOB! Hope everything is going well with you. that fabric is awesome! sucker for some chevron. nice job!